I have what I admit is a limited concept of dumplings. I think of them as savory and filled, such as wontons, pierogi, and my personal favorite, potstickers*. When I'm feeling inclusive, I'll concede that various unfilled doughy concoctions are dumplings as well: matzoh balls, spaetzle, even gnocchi, and so on. Recently, however, I found a recipe for a "dumpling" that turns all my preconceptions about dumplings on their collective head. 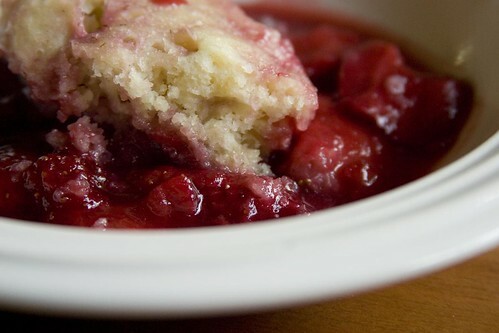 As it turns out, dumplings can be sweet--as sweet as early summer strawberries, to be exact. 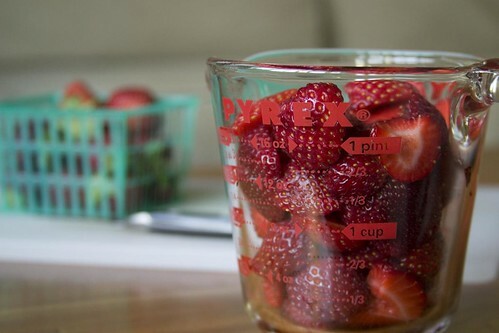 And as luck would have it, I came across this recipe just in time for a new lot of fresh-from-the-fields strawberries. Ruth Reichl's twitter feed consistently gets my stomach growling, but usually it's only with descriptions of the fabulous things she's eating on any given day. This time around she got my stomach growling and linked to a recipe so that I could do something about it. And what a recipe! 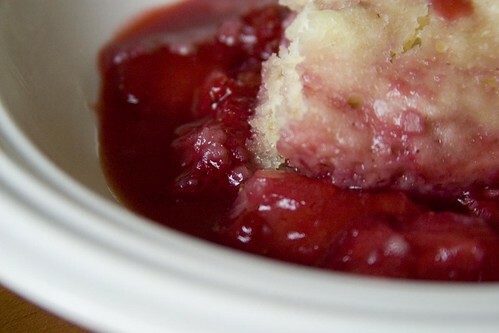 If you like biscuits and you like stewed fruit, you must try this recipe. It's a bit like a cobbler with the topping stirred into the fruit, but stickier and more infused with strawberry goodness. 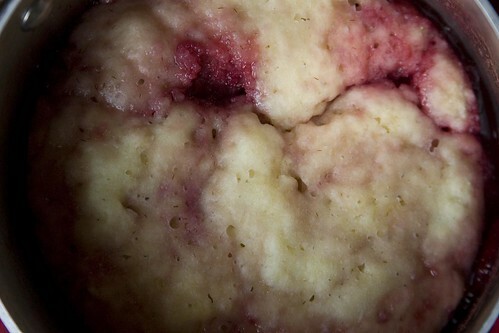 A soft, very wet, biscuit-like dough (almost more like a batter, really) is stirred into a gently bubbling pot of slightly sweetened strawberries and simmered until the dough is cooked. This dumpling is the perfect dessert for those summer days when the warmth of a balmy afternoon doesn't stay for dinner, when by evening you're reaching for a wrap and a warming dessert. The cooking time is short enough that the berries still taste fresh and bright, but long enough that they soften and turn a bit soupy. So if you're not quite ready to plunge headfirst into summer, and want something a bit cozy to do with your early strawberries, take a peek below for the recipe. Toss together the strawberries and sugar in a medium saucepan. Let the berries stand, stirring now and then, for 10-15 minutes, or until juicy. Meanwhile, in a small bowl, whisk together the flour, baking powder, and salt. Using a pastry blender, a couple of knives, or even your fingers, blend the butter into the flour mixture until it looks like coarse meal with a few pea-sized lumps. When the berries are juicy, put the pot over medium heat and stir occasionally until the mixture boils. The berries will release more juice, and the sugar will dissolve. When the mixture reaches a boil, pour the milk into the butter and flour mixture and stir just to combine. The dough/batter will be very wet. Add it to the berries and stir a couple of times. Cover the pot with a tight-fitting lid, and reduce the heat to low. Cook, covered and undisturbed, until the dough has cooked and looks dry on top, 15-20 minutes. Once done, turn off the heat and let the dumpling stand with the lid in place for 5 minutes. Serve drizzled with heavy cream, if desired. This recipe would probably work great with other types of summer fruit--not just berries, but stone fruit. If using stone fruit, the fruit should probably be very ripe so that the cooking time remains short. The amount of baking powder called for in the ingredients list is not a typo, it really does have that much leavening in it. It results in a light, spongy dumpling that is almost pudding-like. * I have a particular weakness for potstickers. In fact, sitting down to write this post gave me such a craving for them that I ordered some for dinner. Yes, I am weak. But they're so good. Those strawberries look so perfectly ripe and luscious - why is it again that I can't buy strawberries that perfect?